Color Inspiration Week 10: Yellow! For anyone who knows me personally & has been following along with these Color Inspiration posts, it's probably pretty shocking that I haven't yet done one that focuses on the glorious color yellow. Yellow is 100%, no questions asked, no if's/and's/but's, my absolute favorite color. It's so happy & cheery & it literally scientifically helps put a smile on your face (evidence: seeing yellow releases serotonin in your brain which is supposed to do good things. I'm not an expert, I just learned this once & I will hold onto it forever.)! Now I understand that I am among the few people in the population who hold yellow to this high standard - in the few random surveys I spotted online, yellow was only getting about 2-8% of the votes - but I'm here to change that. Along with making the world love wool, making the world love yellow is probably my #2 mission. Also world peace. To be honest, yellow has had a rough year. The beloved Crayola Crayon color Dandelion has "retired" (which is just a nice way of saying Crayola cut this beautiful hue out of the lineup). And it was replaced with a BLUE crayon - the injustice! Blue is great color, but that brings the total in the classic 24 crayon box to SIX blues & only THREE yellows. Absolutely ridiculous. You can read my whole angry tweet rant about it, starting with this one here. I really championed the hashtag #bringbackdandelion for awhile. I should probably get on that again. The point is that with this kind of shade going around, I feel that it's incredibly important to let some light in. In other words, we should all embrace the light filled goodness of yellow. I like to surround myself with yellow as much as possible, so these photos are really just snippets of my everyday life. It's a good life! Trader Joe's flowers strike again. For $3.99, I got enough gorgeous flowers to fill 3 medium-sized vases & they are just lighting up my life! Ahhh - this squishy loveliness! I've fallen in love with this yarn (We Are Knitters' The Wool), & I knew I needed to try out the color Honey. It's a rare gem - it genuinely warms the soul when you look at it. My new favorite yellow skirt! It's the best (you can grab it at Madewell). I'm also wearing some killer TOMS heels (they have the best heels! So comfy.) & the Explorer Tank & Rocky Mountain Beanie - both part of the Fall Collection that is debuting tomorrow on the blog & patterns & products will be available for purchase starting next week! I've been doing yoga sporadically for years, but finally it's become a real morning routine for me (and the benefits are amazing! My skin is better, I have more energy - who knew exercise could do such a thing?!). This lovely yellow mat was my mom's, but after years of begging I finally got her to trade me for my boring mat because I love this one so much. The yellow continually makes me smile throughout my practice, & the simple design is great because it helps me to align along the center of the mat. 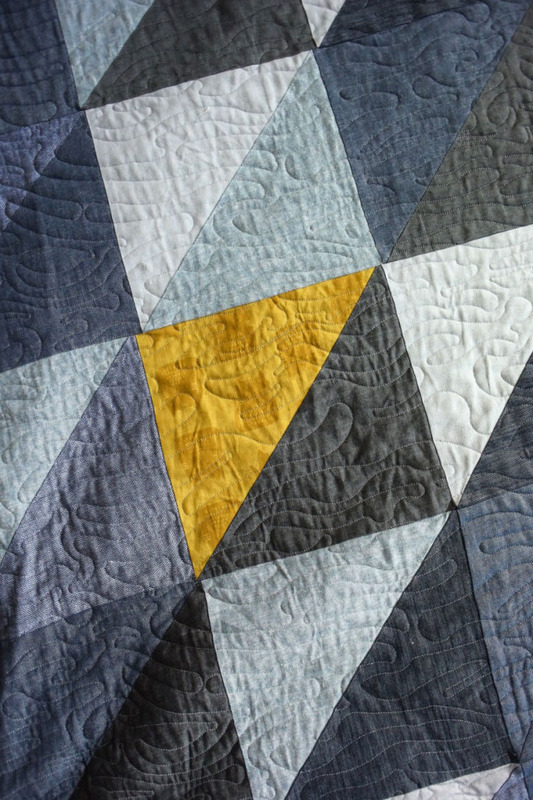 My mom made Grayson & I THE BEST quilt - it's mainly blue/gray denim & chambray triangle/squares but the back is the most awesome mustard yellow cat fabric & she threw it on one of the front triangles as well. Once I finally complete all the pillows that will go on our bed, this baby will get its own Color Inspiration post! Only one palette today, bringing together all the lovely yellows I previewed earlier. I think many of the reasons people struggle with yellow is because they see yellows that are extremely harsh & far too bright - neon signs & McDonald's logos & all that unfortunate stuff. But yellow truly is the color of light to me (we won't get into all the complicated explanations of light & pigment color to debrief on whether or not that statement holds scientific merit) & it brings me so much joy. I hope that your heart is opened to yellow, & that you can find a way to bring it into your life! I've spent pretty much my whole life as a knitter searching for the best yellow yarns, & below you can find a compilation of my favorites. 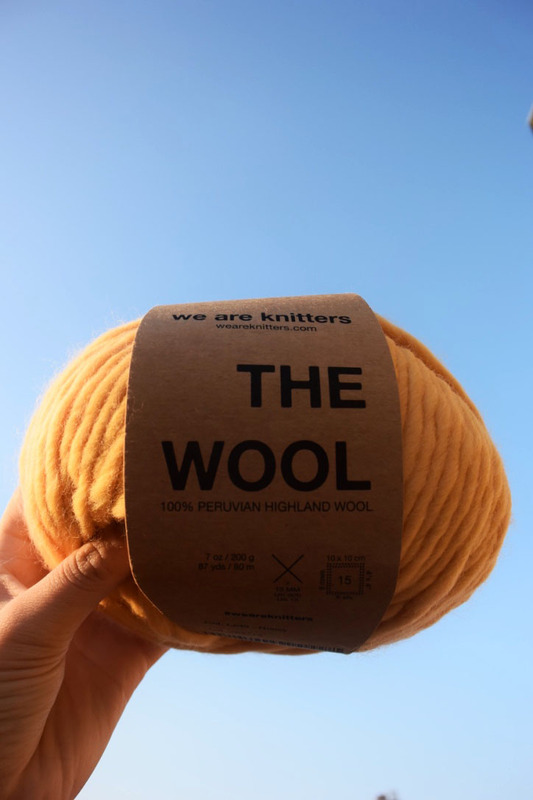 As mentioned above, this is the lovely super bulky The Wool by We Are Knitters in the colorway Honey. You can purchase it here. This yarn is used in my Fall Collection for the City Sweater - debuting tomorrow on the blog with sneak peaks on Instagram! Fool's Gold by Hedgehog Fibres is a forever favorite. The first time I saw it, I knew I wanted every skein in existence. It's so striking & unique, & such a great blend of yellow & other hues! Photo by Wool & Honey. When Brooklyn Tweed released Arbor, I remember seeing this color & thinking "Wow, this is basically Gustav Klimt's yellow gold!". I was studying abroad in Austria at the time & obsessed with everything Viennese - especially Klimt's opulent portraits. Wonderful twist of fate - this color is actually called Klimt! Many of Arbor's colorways are named after the palettes of famous artists. Photo by Brooklyn Tweed. This, to me, is the perfect buttery yellow. And the Puffin base is the best of the Quince bases to show it off! So fluffy & soft! Photo by Quince & Co. I received this colorway, Brass, in a sock weight yarn as part of a color club, & I melted - it is drop dead gorgeous! The name says it all - it's brassy, warm, & basically perfect. Photo by Madelinetosh.